Stars of motorcycle racing’s past and present have heaped praise on the inaugural Cadwell Park International Classic, which took place at the Lincolnshire Wolds venue last weekend (25/26 July). 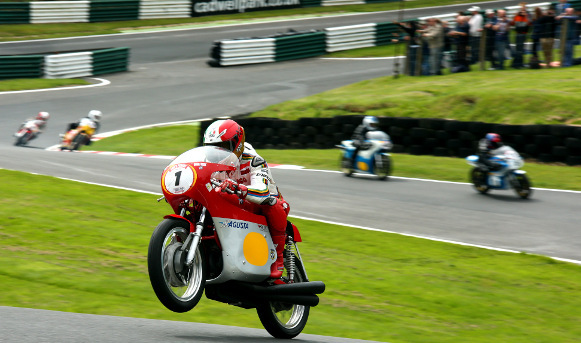 The nostalgic event celebrated all aspects of the circuit’s two-wheeled racing pedigree, with special guests, historic bike racing, and special themed attractions. The star-studded guest list featured two-wheeled racing royalty, including 15-time Motorcycle Grand Prix World Champion Giacomo Agostini, who led a series of special heritage parades. In addition to taking to the track on an MV Agusta, the marque with which he recorded almost all of his title successes, the Italian ace met fans, signed autographs, shared his memories during interview sessions, and presented trophies for some of the races. The Italian shared the track and the main stage with fellow World Champions Jim Redman MBE and former team-mate Phil Read MBE, with whom he engaged in plenty of friendly banter. The special ‘Ago’s Parade’ also featured local legends such as Mick Grant and Derek Chatterton, and celebrated the circuit’s history of hosting motorcycle races at the highest level. The list also included John Cronshaw on a replica of the infamous Honda ‘6’ that took Mike Hailwood to championship glory – a unique machine which truly has to be heard to be believed! Other illustrious guests included 11-time British Trials Champion Sammy Miller, now the owner of a historic bike museum, who brought some of his most prized possessions along to the event. His primary discipline of off-road trials riding was also represented by the Steve Colley Trials show and the Wolds-based Poachers Pre 65 Classic Trials Club in the special demonstration area. Cadwell Park remains one of the most popular stops on the MCE Insurance British Superbike Championship calendar – the series returns to the Lincolnshire circuit in mid-August – and many of the category’s star names were present to indulge in the retro atmosphere. These included series front-runners-turned-pundits Jamie Whitham and James Haydon, plus former champion John Reynolds, and crowd-pleasing veteran Chris Walker. Fellow interviewer and local hero Steve Plater also provided guided tours of the circuit on a vintage bus along with Roger Marshall and Reynolds. He said: “It’s been a great event with all sorts of different things going on both on the circuit and in the paddock, and there are some great names here with a lot of good stories. 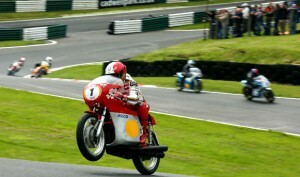 Even the British summer weather couldn’t dampen spirits at the event, which also featured a packed programme of historic bike racing representing from various eras, with historic Grand Prix bikes in the International Classic Grand Prix Series, and the International Historic Racing Organisation. There were also races for the International Classic Superbike Series, Camathias Cup for Sidecars, and Lansdowne Trophy for Pre-1963 Group 1 and 2 motorcycles. Following last year’s 80th Anniversary Meeting, three special races were revived; the Tommy Wood Trophy, Classic King of Cadwell, and Charlie’s Trophy, named in honour of circuit founder Charles Wilkinson.